I received such great feedback from my last post on 30 Irish jokes that it was only fair to put up a new post. A few of these have already been shared on the Irish jokes Facebook page but a few of these Irish jokes will be sent out over the next few weeks. I got this idea from a very simple(and old) Irish joke. You can read it here, and if you enjoy Irish jokes you will also enjoy these Irish memes. 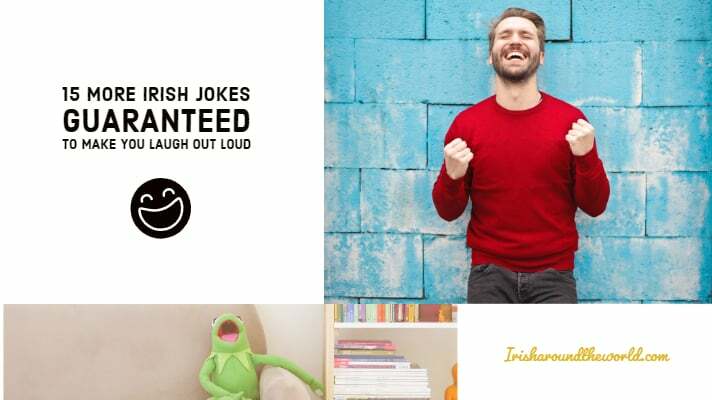 Enough talk lets get into these 15 Irish jokes! On a back country road, she drove up to a large flock of sheep that were slowly crossing the road. As she sat there watching the flock she saw the farmer standing there. The farmer was amazed as he had exactly 347 sheep. He told her to pick her one out and picked a really cute one. As she was putting it into her car. So Paddy leaves the site. Murphy starts packing is kit up to leave as well. He offered her a drink and over the course of the night, he charmed her with funny Irish stories and songs. She’d never had a night like it before and decided to invite him back to her room. They had a passionate affair all that summer. One night, she confided in him that she was pregnant. Not wanting to ruin his reputation or his marriage, he gave her a large sum of money and told her to go back to Italy to secretly have the child. She agreed but asked how he would know when the baby was born. To keep it discrete, he told her to simply mail him a postcard, and write ‘Spaghetti’ on the back. Skinny little Irish man goes into an elevator, looks up and sees this HUGE black guy standing next to him. The little white Irish man faints and falls to the floor. The little white Irish man says: ‘Turner Brown?! …. Sweet Jesus, I thought you said, ‘Turn around!!!! A large Canadian lumber company advertised that they were looking for a good Lumberjack. The very next day, a skinny Irishman showed up at the company with his axe and knocked on the Foreman’s door. The Foreman took one look at the small Irishman and told him to leave. “Just give me a chance to show you what I can do,” said the Irishman. The Irishman headed for the tree, and in five minutes he was back knocking on the Foreman’s door. “I cut the tree down,” said the Irishman. “In the Sahara Forest,” replied the Irishman. Did you enjoy these Irish jokes? I would love to take credit for all of them. They are mostly from Reddit and Twitter. Which Irish joke was your favourite? Comment below. Do share this post with someone having a bad day. Or just to cheer someone up. Remember these are only jokes and please do not take them seriously. Lastly, these get sent out on my weekly dose of Irish newsletter. If you haven’t subscribed you can register here. I liked #9 Irish Joke the best. Thanks!